Barnaby Benson on copywriting: Are overseas companies let down by their English? 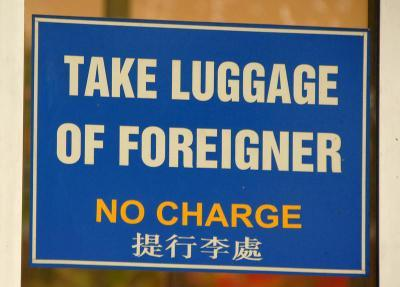 Are overseas companies let down by their English? Some of the world’s largest companies are headquartered in countries where English is the second or even third language. And it shows in their messaging. By using non-native speakers of English to write their websites, companies risk alienating Western buyers and customers. So why do they do it? Those aren’t my words. Honestly. It’s a chapter title from a book on an Indonesia airline. Not great. But as the side panel shows, there’s worse out there. So what’s going on here? Are foreign companies entering Western markets unaware of how important a well written website is? Because they need to be. The website is the new shop window, often forming our first impressions of a company. And in business, first impressions are vital. Out West, one misspelt word can be all it takes to deter a potential client. Sloppy communications are seen as a sign of unprofessionalism and lax quality control. And with only the website to go on, it leaves the potential client wondering: how deep do these issues go? The product? The service? I understand that this is all very unfair. After all, we Western companies don’t have Chinese, Indian or Russian language versions of our sites. (Give it twenty years). But for now, English remains the international language of business. Companies exporting to the West or servicing Western clients need to realise that their site will be compared to the best of their native English-speaking competitors – as well as the super-slick, super-engaging websites of the market leaders. We’re talking BP and Unilever on the corporate side and the likes of Apple and Nike for consumers. Are you sure this is what you mean? The bar for online content has long since been raised, and reaching it isn’t optional – regardless of your mother tongue. More positively, the current misspelt state of badly constructed affairs presents a huge opportunity for overseas companies. With national competitors parading woeful English sites, it’s a great opportunity to stand out as a quality organisation. 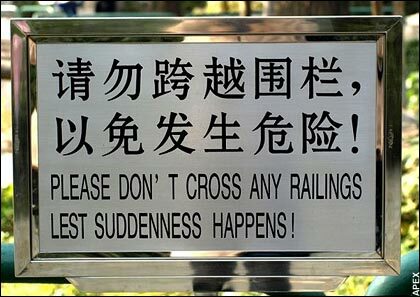 All that’s needed is clear, correct and readable English. It’s not hard or expensive to achieve. 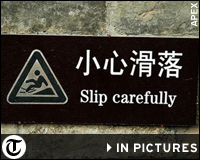 Overseas companies with wonky, ‘English as a second language’ websites are also passing up an opportunity to differentiate themselves. We’re not even talking about sophisticated tone of voice options here. It’s more basic than that. It’s simply about distinctive messaging: how do you do things differently? What benefits does this approach bring? What’s more, foreign writers think like foreign customers. Overseas companies can benefit from having someone from outside their organisation – and their culture – articulate their offer. An English-speaking copywriter can better anticipate the questions a Western consumer will have. They automatically see things from the foreign buyer’s perspective. One of our clients, Jaguar Land Rover, provides an enlightening example. Purchased by the Indian behemoth, Tata, in 2008, rather than switching to cheaper Indian suppliers, Tata continues to use the English creative agencies that previously marketed the legendary car marque. We help with the writing. In fact, it’s just like any other Western global brand. They – that is, we – worry about how customers around the world will receive their communications. So will others follow Tata’s lead? We’re certainly doing more and more for overseas companies, either fixing poorly written English or going further and offering message development and brand tone of voice services. After all, if you want to be a global player, you need to sound like a global player.